Melt Flow Index Testing – Associated Polymer Labs, Inc.
Why pay $125 per sample, Now All Polyethylenes are Just $40 per Sample!! 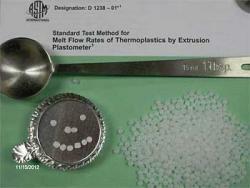 Test method: ASTM D1238 Method for Flow Rates of Thermoplastics by Extrusion Plastometer. Fast Turnaround Time: 1-2 days from receiving the samples. A Summary Report is emailed or a text message sent to your cell phone. Sample size is 1 table spoon (15ml) 12-20 grams in pellet, flake or powder form. What is a Melt Flow Index? Melt Flow Rate (MFR) or Melt Flow Index (MFI) is the flow measurement of polyethylene being pushed through a 2mm diameter die at 190°C with 2.16 kg mass. The result is expressed in grams per 10 minutes (g/10 min). Approximately 6 to10 grams of polyethylene is loaded into the barrel of the melt flow plastometer, heated to a temperature of 190°C. A plunger is placed into the barrel on top of the polyethylene pellets for a specified amount of time with a pre weight. A 2060 gram weight is applied to the plunger to force the molten polyethylene through the 2mm die. Several timed extrudates are collected and weighed. Melt flow rate values are calculated in g/10 min. Payment Terms are paid in full before test results are released. Contact Laura at 518-290-6804 for credit card or PayPal payment. A check can be submitted with samples.